Product #21050 | SKU SWC88BLM5-C BAND | 0.0 (no ratings yet) Thanks for your rating! 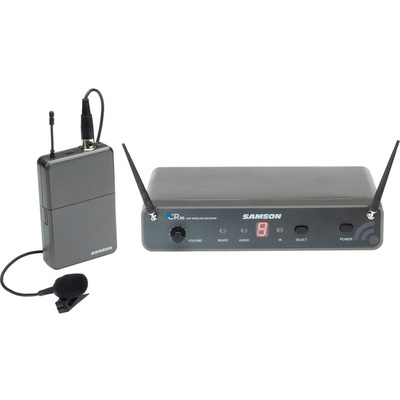 The Samson Concert 8 Lavalier UHF Wireless Microphone Presentation System is designed for live sound reinforcement applications wherein the speaker wants to be free to move around. The system consists of a half-rack UHF receiver, a beltpack transmitter, and an LM5 lavalier microphone with clip. The receiver features a true-diversity dual-antenna design whereby internal signal processing switches to the antenna that is receiving a stronger signal. This helps to prevent drop-outs and maintain a more accurate transmission. The unit includes a tone key and an auto-mute function to eliminate noise if the receiver ever looses the signal. For controls, the receiver features a power button, volume knob, select button, a 7-segment channel indicator LED, as well as audio ready, peak, and IR indicator lights. Up to 16 of these systems may operate simultaneously on two frequency bands from a maximum operating range of 300 feet. The beltpack transmitter is synced with the receiver via infrared. It can operate for up to eight hours on two AA batteries. For convenience, the lavalier microphone includes a spring-loaded clip so you can attach it to your lapel.